Minnesota. Temperatures as low as −60 °F (−51 °C) have occurred during Minnesota winters. Spring is a time of major transition in Minnesota. Snowstorms are common early in the spring, but by late-spring as temperatures begin to moderate the state can experience tornado outbreaks, a risk which diminishes but does not cease through the summer and into the autumn. In summer, heat and humidity predominate in the south, while warm and less humid conditions are generally present in the north. These humid conditions initiate thunderstorm activity 30–40 days per year. Summer high temperatures in Minnesota average in the mid-80s F (30 °C) in the south to the upper-70s F (25 °C) in the north, with temperatures as hot as 114 °F (46 °C) possible. The growing season in Minnesota varies from 90 days per year in the Iron Range to 160 days in southeast Minnesota. Tornadoes are possible in Minnesota from March through November, but the peak tornado month is June, followed by July, May, and August. The state averages 27 tornadoes per year. Minnesota is the driest state in the Midwest. Average annual precipitation across the state ranges from around 35 inches (890 mm) in the southeast to 20 inches (510 mm) in the northwest. Autumn weather in Minnesota is largely the reverse of spring weather. The jet stream—which tends to weaken in summer—begins to re-strengthen, leading to a quicker changing of weather patterns and an increased variability of temperatures. By late October and November these storm systems become strong enough to form major winter storms. Autumn and spring are the windiest times of the year in Minnesota. The climatological effects of Lake Superior tend to stifle convection, thus limiting the potential for tornadoes. Although Cook and Lake counties are two of the largest counties in the state, they have experienced only seven tornadoes in the past 56 years. One of those tornadoes was a large F3 that occurred in the 1969 Minnesota tornado outbreak. Even though winter does not officially start until late December, Minnesota usually begins experiencing winter-like conditions in November, sometimes in October. As with many other Midwestern states, winter in Minnesota is characterized by cold (below freezing) temperatures and snowfall. Weather systems can move in from the north, west, or south, with the majority of the weather being driven in from the north. A vigorous jet stream brings high and low-pressure systems through in quick succession, which can cause large temperature variations over a short period of time. As the last remnants of summertime air in the southern U.S. start to lose their grip, cold polar air building up in northern Canada starts to push farther south, eventually spreading into Minnesota. By the time December and January arrive, Minnesota is fully engulfed in the polar air and is then subjected to outbreaks of arctic air masses. Because there are no natural barriers north or northwest of Minnesota to block arctic air from pouring south, Minnesota gets regular shots of the arctic air through the winter. High pressure systems which descend south from the Canadian plains behind the fronts bring light winds, clear skies, and bitterly cold temperatures. The northern part of Minnesota gets the brunt of the cold air. International Falls, sometimes called the "Icebox of the nation", has the coldest average annual temperature of any National Weather Service first-order station in the contiguous United States at 37.4 °F (3.0 °C). Tower, Minnesota, sinks below 0 °F (−18 °C) on an average of seventy-one days per year, while the ten coldest counties in the contiguous US, based on January minimums, are all located in Minnesota. The air mass then slowly moderates as it moves south into the rest of the state. Alberta clippers alternate with these high-pressure systems, bringing high winds and some snowfall with them. As spring progresses, the jet stream starts to push storm systems farther to the north, and southern Minnesota becomes more prone to severe thunderstorms and tornadoes. As spring moves into the later stages, the chances for snow continue to drop and eventually disappear, south to north. By the time it gets warm enough for severe weather in northern Minnesota, the strength of storm systems have usually started to decrease, which results in fewer severe storms in northern Minnesota compared to the southern part of the state. A bridge connecting East Grand Forks, Minnesota, to Grand Forks, North Dakota, during the record flooding of the Red River in 1997. ^ "NCRFC Climate and Topography". NOAA. Retrieved 2006-11-10. ^ "Minnesota Climate Facts". Minnesota DNR. 2004. Retrieved 2006-11-10. ^ "U.S. Extreme Record Temps & Differences". Golden Gate Weather Services. 2005. Retrieved 2006-11-23. ^ Daly, Christopher (1990). "Annual Average Precipitation". Desert Research Institute. Archived from the original (JPG) on 2006-12-30. Retrieved 2006-11-10. ^ "Climate Extremes for Minnesota". Minnesota Climatology Office. September 8, 2004. Archived from the original on October 5, 2006. Retrieved 2006-11-10. ^ a b c Keen A., Richard (1992). Minnesota Weather. American and World Geographic Publishing. ISBN 978-1-56037-000-0. ^ a b c d e f Seeley W., Mark (2006). Minnesota Weather Almanac. Minnesota Historical Society press. ISBN 978-0-87351-554-2. ^ a b "superior pursuit: facts about the greatest great lake". Minnesota Sea Grant. Retrieved 2007-06-01. ^ "Lake Superior Uplands". Minnesota DNR. Retrieved 2007-02-25. ^ "Average climate in Minnesota". citydata.com. Retrieved 2006-11-10. ^ "Snowfall, 2005-11 – 2006-04". Minnesota Climatology Office. 2006. Archived from the original on 2006-12-07. Retrieved 2006-11-10. ^ "Climate Summaries". University of Illinois. Archived from the original on 2006-11-12. Retrieved 2006-11-10. ^ a b c Ross, Douglas. "U.S. Climate Normals". NCDC. Archived from the original on 2013-02-18. Retrieved 2006-11-10. ^ "Minnesota Tornadoes by County 1950–2005" (JPG). NOAA. 2005. Retrieved 2006-11-26. ^ a b Ross, Douglas (1971–2000). "Daily Normals for Alexandria, Minnesota". NCDC. Retrieved 2007-06-07. ^ a b Ross, Douglas (1971–2000). "Daily Normals for Brainerd, Minnesota". NCDC. Retrieved 2007-12-27. ^ a b Ross, Douglas (1971–2000). "Daily Normals for Duluth, Minnesota". NCDC. Retrieved 2007-06-07. ^ a b Ross, Douglas (1971–2000). "Daily Normals for Grand Marais, Minnesota". NCDC. Retrieved 2007-12-27. ^ a b Ross, Douglas (1971–2000). "Daily Normals for International Falls, Minnesota". NCDC. Retrieved 2007-06-07. ^ a b Ross, Douglas (1971–2000). "Daily Normals for Redwood Falls, Minnesota". NCDC. Retrieved 2007-06-07. ^ a b Ross, Douglas (1971–2000). "Daily Normals for Thief River Falls, Minnesota". NCDC. Retrieved 2007-06-07. ^ a b Ross, Douglas (1971–2000). "Daily Normals for the Twin Cities". NCDC. Retrieved 2007-06-07. ^ a b Ross, Douglas (1971–2000). "Daily Normals for Winona, Minnesota". NCDC. Retrieved 2007-06-07. ^ a b Ross, Douglas (1971–2000). "Daily Normals for Worthington, Minnesota". NCDC. Retrieved 2007-06-07. ^ a b c "Climate of Minnesota" (PDF). NCDC. Archived from the original (PDF) on 2006-09-29. Retrieved 2006-11-10. ^ Potter, Sean (August 10, 2006). "Icebox of the Nation". USA Today. Retrieved 2006-11-10. ^ Best Places to Live in Rural America. Progressive Farmer's 2007 Annual Report. 2007. ^ Gianassca, Frank. "Zonal winds tend to bring calm weather". USA Today. Retrieved 2006-12-03. ^ Palmer, Chad (2007-11-01). "Meridional flow brings extreme weather to USA". USA Today. Retrieved 2007-12-19. ^ Palmer, Chad. "Alberta Clippers reinforce cold air". USA Today. Retrieved 2006-11-15. ^ Metcalfe, John (2011-01-05). "Winter storm class: The Clipper with different names". abc2news.com. Archived from the original on 2011-01-15. Retrieved 2011-02-14. ^ Henson, Bob. "Alberta Clipper". The Weather Notebook. Archived from the original on 2015-02-19. Retrieved 2006-11-10. ^ a b Douglas, Paul (1990). Prairie Skies. Voyageur Press, Inc. ISBN 978-0-89658-208-8. ^ "Lake Effect Snow". The Weather Channel. Archived from the original on 2007-03-04. Retrieved 2006-12-08. ^ "Panhandle Hook". NOAA. Retrieved 2006-11-15. ^ "Panhandle Hook". NOAA. Retrieved 2006-12-03. ^ "Spring and Summer Bring Stormy Weather". National Center for Atmospheric Research. Archived from the original on 2007-02-21. Retrieved 2006-12-08. ^ a b c d "Minnesota Tornado History and Statistics". Minnesota Climatology Office. September 20, 2006. Archived from the original on 2007-08-11. Retrieved 2006-11-10. ^ "April Fool's Day Snowfall of 2002". Minnesota Climatology Office. April 2, 2002. Archived from the original on December 7, 2006. Retrieved 2006-11-10. ^ "Buffalo Ridge Wind Power Plant". Xcel Energy. Archived from the original on May 7, 2006. Retrieved 2006-11-02. ^ "Flood Information". Army Corps of Engineers. Archived from the original on 2001-09-15. Retrieved 2006-11-24. ^ "2007 Federal Disaster Declarations". FEMA. August 26, 2007. Retrieved 2007-08-27. ^ "The Mississippi River Flood of 1965". NOAA. November 8, 2005. Retrieved 2006-11-18. ^ "Famous Minnesota Winter Storms". Minnesota Climatology Office. December 10, 2001. Archived from the original on January 7, 2009. Retrieved 2006-11-24. ^ "Climatic Conditions Leading to the Spring Flooding of 2001". Minnesota Climatology Office. April 21, 2001. Archived from the original on December 7, 2006. Retrieved 2006-11-24. ^ Larson, Lee (June 28, 1996). "The Great USA Flood of 1993". NOAA. Retrieved 2006-11-24. ^ "Heavy rains fall on southern Minnesota: August 18 – August 20". Minnesota Climatology Office. August 22, 2007. Archived from the original on February 23, 2011. Retrieved 2007-08-24. ^ "Significant Flooding and Heavy Rain of September 22-23, 2010". National Weather Service, La Crosse, Wisconsin office. September 27, 2010. Retrieved 2011-03-09. ^ Cappella, Chris (December 3, 2003). "Typical speeds of jet stream winds". USA Today. Retrieved 2006-11-10. ^ "U.S. Thunderstorm Distribution". NOAA. Archived from the original on October 15, 2006. Retrieved 2006-10-25. ^ "Air Temperatures & Dew Points – Great Lakes States". Minnesotans For Sustainability. Retrieved 2006-11-10. ^ "Tuesday, July 7, 1936: How to keep cool". Minneapolis Star Tribune. Archived from the original on 2007-03-14. Retrieved 2006-11-10. ^ "Normal Precipitation Maps". Minnesota Climatology Office. November 13, 2003. Archived from the original on October 5, 2006. Retrieved 2006-11-10. ^ "The Boundary Waters-Canadian Derecho". NOAA. Retrieved 2006-12-03. ^ "High Dew Point Temperatures". Minnesota Climatology Office. July 28, 2005. Archived from the original on February 8, 2007. Retrieved 2006-12-08. ^ "Drought of 1988" (PDF). Minnesota DNR. January 1989. Archived from the original (PDF) on 2006-12-11. Retrieved 2006-11-21. ^ "Timeline of the Dust Bowl". PBS. Archived from the original on 2012-03-07. Retrieved 2006-11-26. ^ "Monday, Oct. 14, 1918: Hundreds die in Cloquet fire". Minneapolis Star Tribune. November 11, 2005. Archived from the original on 2007-03-16. Retrieved 2006-11-26. ^ "Cavity Lake fire nearly history". Associated Press. August 6, 2006. Archived from the original on December 20, 2010. Retrieved 2006-11-26. ^ "Sauk Rapids History". City of Sauk Rapids. Retrieved 2006-11-10. ^ "Jet Stream". University of Illinois. Retrieved 2006-11-23. ^ "Local Climate Records". NOAA. Retrieved 2006-11-23. ^ Boulay, Pete. "Hey How's the Weather? — July – August 2003". Minnesota State Climatology Office. Archived from the original on 2007-02-03. Retrieved 2007-01-22. ^ "Record Low Pressure Hits Minnesota October 26–27, 2010". Minnesota Climatology Working Group: University of Minnesota. 2010-10-26. Archived from the original on 2010-10-31. Retrieved 2010-10-27. ^ "Armistice Day Storm". NOAA. Retrieved 2006-11-23. ^ "Tuesday, Nov. 12, 1940: Armistice Day blizzard". Minneapolis Star Tribune. Archived from the original on 2006-09-20. Retrieved 2006-11-23. ^ "Top 5 weather events of the 20th Century". Minnesota Climatology Office. Archived from the original on 2006-12-07. Retrieved 2006-12-03. ^ a b Dregni, Eric; Mark Moran; Mark Sceurman (2006). Weird Minnesota. New York, NY: Sterling Publishing. ISBN 978-1-4027-3908-8. ^ a b Lass, William E. (1998) . Minnesota: A History (2nd ed.). New York, NY: W.W. Norton & Company. ISBN 978-0-393-04628-1. ^ "Winter Carnival: History". 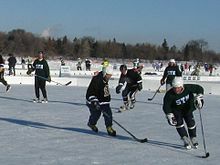 St. Paul Winter Carnival. Archived from the original on January 29, 2007. Retrieved 2007-02-04. ^ "Review of Fargo". The New York Times. Retrieved 2007-02-11.